Redingote Groom Jacket in Blue Wool Blend Peak classic lapel with angled buttonholes and satin trims in contrast, no poc... Redingote Groom Jacket in Blue Wool Blend Peak classic lapel with angled buttonholes and satin trims in contrast, no pockets on the front and Redingote-style seams on the back to better stylize the figure. One single vent, one covered button in contrast with angled buttonholes on the front and 3 covered buttons in contrast with angled buttonholes for each sleeve. Rounded finish to stylize the figure and length of jacket typically suitable from the groom. 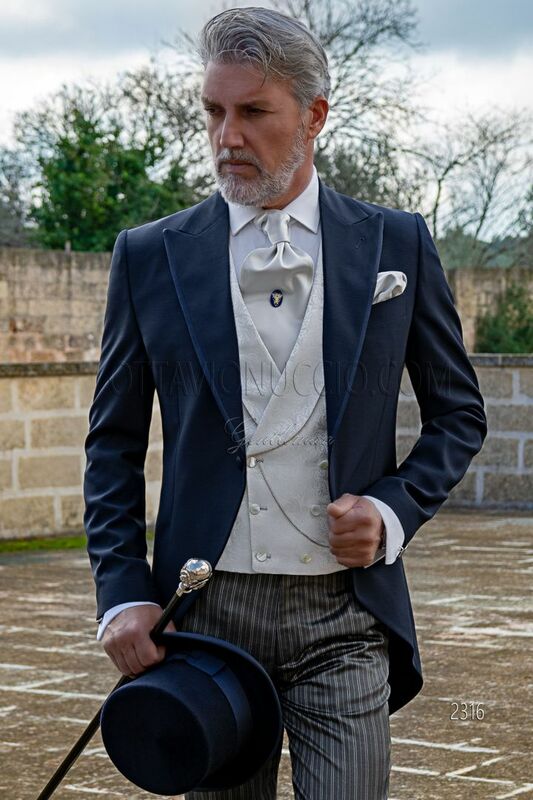 Cravat and handkerchief set made from pearl grey silk blend satin. Handmade.